To understand the all-new 2019 Honda Passport you need to look back to the beginning of the mainstream SUV in the early ‘90s, and the likes of the Toyota 4Runner, Nissan Pathfinder and Ford Explorer. Most of those had 4WD, five doors and two rows of seating. It was a time before we had CUVs, crossover coupes, subcompact crossovers and Nissan Murano Crosscabriolets. In short, like the SUVs of the day, it was a much simpler time. Now, it often feels strange when SUVs don’t have a third row or seating for 12, a trend that has been developing ever since people started choosing them over minivans. Like those SUVs of yesteryear, the Passport is available only with AWD across three trims (Sport: $41,990, EX-L: $45,590 and Touring: $48,990), and it gets five doors and two rows of seating. Otherwise, it’s pretty much a Pilot with about six inches or so cut off behind the rear wheels – at 2,820 mm, the wheelbase is the same as the Pilot but the Passport gets a slightly larger turning radius thanks, Honda says, to the wheels and tires being wider. In practice, what that means is you get the same rear seat room in the Passport as you do in the second row of the Pilot, and due to there being no third row to worry about, 100 fewer litres of cargo volume behind the rear seats, where the Passport’s 1,430 L plays the Pilot’s 1,583 L.
There’s also a foot-activated liftgate and underfloor storage back there but the real eye-opener are those rear seats, which are massively roomy and absolutely fine for adults. They are heated on the top two trims and while they do recline (nice) and fold flat, I do wish they could fold 40/20/40, but that seems a feature that Honda steadfastly ignores as they insist their customers aren’t too bothered by it. Personally, I’d prefer to not lose an entire seat in order to fit longer items, but that’s me. You can easily see what’s going on back there, meanwhile, thanks to the convex mirror mounted to the sunglass holder. Honda’s goal with the Passport is to bridge the gap between the CR-V and Pilot, leaning a bit closer to the Pilot; Honda says that potential buyers are more likely to consider the Passport over the Pilot than the Passport over the CR-V. The Passport’s internals – V6 with 280 hp and 262 lb-ft, AWD with torque vectoring – are much more similar to the Pilot’s, just in a smaller package. Eagle-eyed readers will also see that the Passport starts at only about $1,000 less than the base Pilot, though it comes better equipped at base than does its bigger sibling. Honda also says that they’ve had buyers walk out because they simply haven’t had a mid-size CUV offering until now. 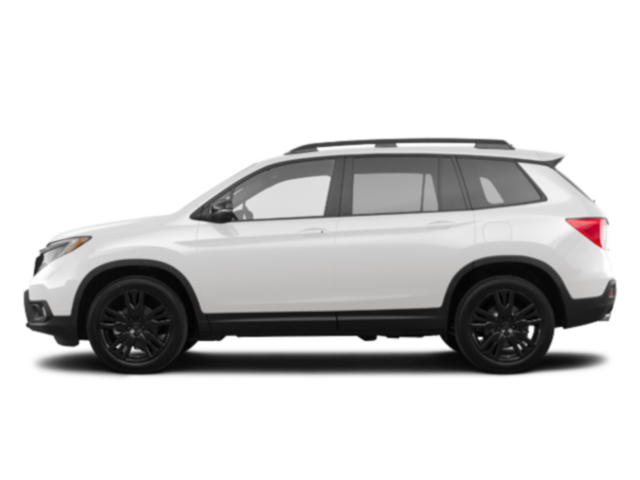 Oh, and if you’re asking: yes, there’s a little bit of the Ridgeline in the Passport as well, as Honda says the latter’s stiffer suspension tuning is actually more akin to the Ridgeline that it is to the Pilot. It can be said, then, that the Passport is a mix of all things Honda truck, this side of the little HR-V.
Styling-wise, the Passport proudly displays Honda’s latest front-end, but thanks to a gorgeous blacked-out grille (flanked by LED headlights on the Touring), it wears it as well as – if not better than – any other product in the portfolio. It’s a neat way to make the Passport just that much more appealing to younger buyers; it’s just too bad that you can’t get bright colours such as the CR-V’s molten lava pearl. The deep scarlet pearl on the vehicle you see here, however, is very classy and the whole package looks a little richer thanks to the black 20-inch wheels, standard on all trims. Inside, the Passport is immediately recognizable as a Honda: modern dash with flared surfaces and topped by a low-profile 7-inch infotainment display (with a volume knob, yes), chunky three-spoke heated steering wheel, button-select transmission and 10-way power adjustable seats shared with the Pilot. The result is that the front, like the rear, is airy and roomy with good ergonomics. While the Passport technically is full-time AWD, only about 5% of power is sent rearwards during normal driving. Up to 70% can be sent to the rear axle, and 100% of that available power can then be dispatched to either wheel depending on the situation. Honda has tuned the AWD system a little differently here than in the Pilot, as it expects to see the Passport being used for more sand or loose gravel work. We spent a large portion of our test in similar conditions, the roads in rural Quebec being covered in a mix of sand, gravel, road salt and packed snow, with proper pavement underneath. Allegedly. Here, the Passport did not disappoint. You can feel the different suspension tuning as soon as you set off, the smaller Honda riding quite firmly over smaller, repetitive bumps but displaying less body roll that the Pilot. Indeed, the Passport really does feel like a more performance-oriented piece of engineering. It’s light on its feet – perhaps too light, as we did sense some rear-axle hop on bumpier roads – with a responsive steering rack to match. You need to watch it, though; since it is so light on its feet, you may find yourself pushing a little harder in adverse conditions than you normally would, and getting some slip as a result. It’s easily reigned in by the AWD, stability control and traction control systems, but you need to be conscious of it. Do so, and you’ll be rewarded with a properly involved ride, somewhat unbecoming of the Passport’s rivals like the Ford Edge or Nissan Murano. This is a fun, scrappy little trucklet that, in these conditions, does a fine job of recalling those SUVs of old. Less like the SUVs of old, however, is the way the Passport handles some bigger bumps during a stretch of heaving gravel road; divots that should have caused the chassis to shudder just didn’t as they were properly absorbed by the dampers. Of course we can wax nostalgic all we want but the thing about the Passport is that it’s not old, and once you get back on to the beaten track, all that comes into focus. It starts with the HondaLink infotainment system which, now that it has a proper volume knob, is actually a pretty slick and intuitive interface that looks great on that low-profile screen. You can hit a “home” button if you’d like, but after a while I realized there was really no need to as all of the system’s major functions can be accessed via shortcuts atop the screen. Your navi, audio and home menus are all here, a single button press away. Or, you can go ahead and activate either Apple CarPlay or Android Auto, both standard on all Passport trims, while the Touring trim also gets wireless charging. Since we were testing the top Touring trim, we also had 9-speaker plus subwoofer, 550-watt audio and holy moly, is it ever good. Rich and with almost no distortion, I couldn’t believe it when I cranked the mp3 audio through my Bluetooth and heard nary a complaint from the speakers. Would be nice if this could be optioned for the other trims; it’s that good. Of course, no modern CUV would be complete without a host of electronic driving aids, and so it goes that base Passports get adaptive cruise, lane keep assist, auto high beam and LaneWatch (your infotainment screen becomes a blind sport monitor), while the top Touring trim gets blind spot warning and rear cross-traffic alert. You can really feel that lane-keep assist do its work, too, so much so that I think I’d actually like the option to minimize just how much it intervenes, a feature not unheard of in the market today. That’s really a nitpick, though; you can just turn it off if it bugs you with the press of a button by your left knee. The bottom line is that Honda has identified a need in their lineup and with the Passport, they’ve made strong efforts to address it. It’s a vehicle that should do very well, because it’s what the SUVs (and latterly, CUVs) were always supposed to be, before a third row was like some kind of requirement: capable, fast enough, good-looking and comfortable when it needs to be.